Good lord, your pregnant back will thank you. Do Belly Bands Help With Pain? Will a Belly Band Hurt My Baby? Can I Wear a Maternity Belt to Bed? I couldn’t believe how painful the added stress of my pregnant belly on my back was. My lower back was incredibly sore. Even just walking around the house was excruciating. Need to save money on baby? Get our free cheat sheet and learn over 50+ smart ways to save money as new parents. You'll be glad you did! Belly bands solve it all: it’s incredible how much relief and support they give, and when you’re really, really pregnant, you need all the support you can get. I simply couldn’t have lived without mine. What’s nice is that some of them help keep your pants up. Sounds funny, right? What I mean is that as your belly gets bigger, your favorite jeans quickly stop fitting. A belly band can do its magic and let you wear them unbuttoned, extending the life of your favorite jeans well into your pregnancy. They’re awesome. And you really need one! My two favorite belly belts are the Gabrialla and Bellaband, both for different reasons. One is way more supportive than the other, but one is more fashionable. Take your pick! My favorite supportive belt, and the one I used during my pregnancy, the Gabrialla maternity support belt (click here to check price on Amazon) does an awesome job at supporting the belly and back. It’s comfortable to wear against the skin, and you shouldn’t experience any itchiness or scratchiness. You can wear it right under a shirt and it won’t even be noticeable. I found that it poked slightly into my thighs when I sat down on a hard chair, but it doesn’t bother you much. It’s comfortably warm in the cooler months, but you might experience sweating under it in the hotter months; it’s not that breathable since it’s made of synthetic materials. Other than that, it’s an awesomely-supportive maternity belt and I couldn’t have lived without it. To fit: measure the circumference from the small of your back just above the sacrum all the way around to the front about midway between your naval and your pubic bone. If back support isn’t as important as extending the life of your non-maternity clothes and covering up that belly, the Ingrid & Isabel Bellaband (click here to check price on Amazon) is a great pick. They come in a variety of colors and if you’re like me, you’ll want to get a couple to fit your wardrobe. However, the lighter colors do sometimes make it easier for people to see that your pants are unzipped and not buttoned up. A lot of moms love this for letting them wear their favorite clothes far into their pregnancy (sometimes the entire way!) The only real problem is that it can sometimes ride up in the back, which is a problem most bands of this type have. Not really a big deal. What Does a Maternity Belt Do? First of all, the back support is amazing. Believe me, the back pain you’ll probably experience during the later months of your pregnancy can be agonizing. They also help hold your pants up! Somewhere around 10 weeks I had a hard time buttoning my pants up, and by 13-14 weeks it was almost impossible. No matter how hard you fight it, there will come a day where you can’t button up your favorite jeans and tears will be shed. I hate the idea of having to buy special maternity pants, and the right belly belt makes it so you don’t even have to. Basically, you can leave your pants completely unbuttoned and just use the belly band. And if you’re worried about them falling down, believe me, it won’t happen. Nope, you’re not going to feel your zipper or buttons digging into your skin. However, you might be a little disconcerted by the feeling of not having your pants zipped up. It should pass, though. They save you money. Since you can go much longer without maternity clothes, you’ll save money that you’d normally blow on shirts and pants that you’ll wear for a few months and never wear again. Grr. Shirt extender? Yes please. Once your maternity shirts start to get too small, you run into the problem of your belly starting to stick out. I hate it. And unless you’re trying to portray that mother earth vibe, you probably do too. Wearing a belly band eliminates the problem, because it hides all of it. Cha-ching! They provide extra warmth in the cold. If you live in a cold climate, you know all about layering clothes to keep warmer. The maternity belt adds an extra layer around the midsection, which makes a surprising difference in how warm you stay. They’re also nice in hot weather. Some moms like to wear them with a skirt and a tank top. Having as much skin exposed makes a huge difference in comfort, especially when you’re pregnant. You can still use them after you give birth. If you’re like most women, you’ll still have trouble fitting into your old clothes for a while after you give birth. A belly band can be used during that transition period. Here are some common questions women have about maternity belts and belly bands. Not true! The typical belly band has been around for a while, and it’s true that they used to be somewhat uncomfortable. A lot of advances have been made in them, though. Different materials are used and the designs have changed, making them way more comfortable than they used to be. Sure, you’ll be conscious of the belt when you first start wearing it. It’s an odd feeling, and if you wear your pants unbuttoned, the feeling can be a little uncomfortable. It’s something you quickly get used to, and the support and other benefits they provide easily outweigh the initial discomfort you’ll experience. You might find that it gets a little uncomfortably tight after a meal. If so, just fold it down a bit so it rests lower on the abdomen. Presto, you’re comfortable again. Do Belly Bands Really Help With Pain? It’s pretty common for pregnant moms to experience bad back pain. The added weight of the abdomen puts a heavy strain on the lower back, and it can become pretty excruciating. During your pregnancy, your body starts to produce hormones meant to relax and prepare you for birth. Unfortunately, this also means relaxing certain muscles and ligaments that help support the belly, and making matters even worse, your center of gravity will change, along with your posture. If back pain is your main concern, you should look for a band that is specifically designed to help with it; some are only meant to cover up the belly and don’t offer much support. But yes, getting some pregnancy belly support can really help. Do Belly Bands Help Prevent Stretch Marks? Unfortunately, no, they don’t help prevent stretch marks. You might have heard otherwise, but the truth is that they don’t. However, there is really nothing that can prevent the. Will Wearing One Hurt My Baby? The tightness of the belly band might concern you at first, but as long as you’re wearing it low and properly, it’s not going to cause any kind of problem. You’ll know if it’s too tight if it’s way too uncomfortable on you. It’s not going to hurt your little passenger, though. 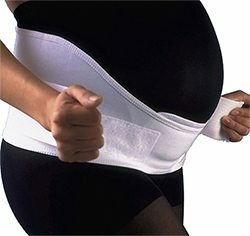 If you’re experiencing bad pain at night, wearing a maternity belt just might do the trick. Sure, you can wear it. You might also want to try a pregnancy pillow if you don’t have one yet; they make a world of difference when trying to sleep. Check out our guide on those here. What Belly Band Should I Get? In case you missed the recommendations above, I highly recommend the Gabrialla maternity support belt. You can click here to see it on Amazon, which is where I recommend buying it. The ultimate pairing with a good belly band is a good, supportive pair of shoes. If you’re like me, your feet will end up swelling and growing a LOT during your pregnancy. My feet went up an entire shoe size and never went back to normal! Be sure to read my post on my favorite shoes for pregnant women, too! Are You a New Parent or Parent-To-Be? If you're going to have a new baby coming into the house soon, I highly recommend getting a copy of my free eBook: "57 Ways To Save Money As New Parents"! It's full of great ways to save money and it's totally free. If you're interested, you can get your copy below! How to cope with your splitting headaches. Clues that your little one might soon make their grand appearance. For when you just can't control your emotions. What's the deal with this annoying (and common) problem? There's no need to suffer. Otherwise known as "false labor", and it's no fun at all. 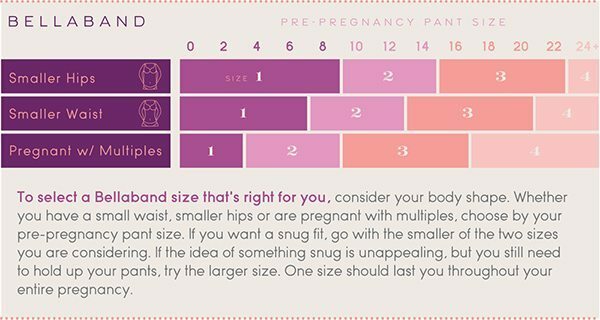 Is your sizing chart for the Gabriella band based off of pre-pregnancy belly circumference? Katelynn, the chart should be used for your current measurements. I hope that helps! All information on this website is intended for entertainment and educational purposes only. It is not a replacement or substitute for professional medical advice and/or treatment. See here for our full disclaimer. © 2014-2019 MomTricks. All Rights Reserved. Almost done! Enter your email to receive your free guide instantly to your inbox. Need to save money on baby? Click here to get our free guide!